Before looking at skin health, hopefully you’ve read my previous posts on digestion, water, and pH. If not, consider reading them in chronological order. Why? Because skin health comes from the inside out, and without proper digestion and proper electrolyte balance, the body is not able to cleanse itself properly, and the health of the skin suffers. Remember that the skin is actually the body’s largest organ! Attempting to heal and beautify the skin without addressing toxicity, electrolyte balance, liver function, and digestion is often an exercise in futility, no matter how much money one spends on expensive cosmetics. The measures that can be taken to improve skin and tissue health are often not possible for an individual to accomplish without first dealing with these issues. However, once these issues are being addressed, then there is a great deal one can do to improve skin health. By improving skin health, one is also increasing the body’s ability to naturally detoxify. Remember that the skin breathes! In this post, I’d like to share a few of my choice skin cleansing and healing secrets, so that others may learn to safely and effectively enjoy the use of healing clay for skin use. Unlike soap, clay removes undesirable contaminants and waste products from the skin by a method called sorption, leaving the skin absolutely clean as the clay is washed away. Think of clay as the opposite of soap. It literally pulls waste from the body, unclogging pores and stimulating circulation as it does so. Tiny clay particles also attach to dead skin cells and help to remove them from the surface of healthy tissue. The more that clay is used on a regular basis in place of pore-clogging chemicals, the better the skin can breath, and the more healthy skin can become. While clay is sorpting,– and in some cases absorbing– contaminants, debris, and waste material, it is also delivering trace minerals directly into the skin. By understanding that sorption is always “a two way street”, one can modify the water used to hydrate clay, enhancing the benefits of clay use. While a clean water is best for internal use, a mineral-rich water is often the perfect choice for hydrating clay for external use, specifically when using clay for skin health. A super-hydrated clay gel can be used in place of soap. A super-hydrated clay is a clay gel made with as much water as the clay can hold without falling apart. The hydration point(s) of a clay gel depend upon the clay use. Some clays, like our favorite green desert clay, are water loving and hence swelling clays (hence the term “The World’s Most Powerful Facial”). Others, such as French green illite, are water neutral. Still others, like zeolite, are “water hating”. Each of these natural minerals have unique properties, while they all share a set of common properties, such as sorption. The best way to use clay in place of soap is to apply it to the body before a shower or a bath in the same manner one would if using liquid soap. 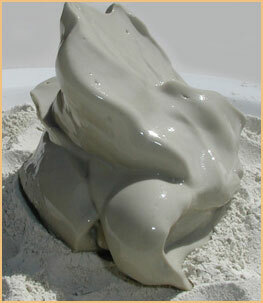 Allow the clay to dry to the point it is “tacky”, and then shower with warm to hot water to remove all of the clay. Remember that clay likes to adhere to and dead damaged tissue. Rinse extremely well in order to remove all of the clay! Individuals with VERY healthy hair can use clay to strip oils and contaminants from the scalp and the hair, once to twice weekly. For hair use, it may be a good idea to water down clay even further prior to applying it; this makes it easier to completely rinse the hair. Individuals with very oily skin (yet otherwise healthy) can use clay even more often, if desired. Some people can even use clay daily. A few drops of essential oils can be added to hydrated clay just prior to use. There are many excellent organic essential oils that work well with clay. Some of my favorites include rose wood, eucalyptus, naoli, neem, frankincense, and geranium. For skin health, any pineal oil, while strong, stimulates and invigorates the skin. There are many methods of using clay, and many fun formulas that can be used that are extremely healthy. For deep facial skin cleansing, this is the method I’ve used and taught for years, which is quite different from the methods taught at most cosmetic schools. It’s perfect for use with our green desert clay or the skin care/spa clay that I’ve developed. With clay pre-prepared and ready to go, apply the first tacking coat. A tacking coat is a very small amount of clay gel applied to the skin. One rubs the clay deep into the skin, massaging all of the acupressure points of the face while doing so. By the time the “coat” of clay is finished, it shouldn’t even be visible on the skin. If using something like our bulk green desert clay, the skin should become tacky very quickly. Once the clay has “set”, apply a second coat in the same manner as the first. Then, apply a third, in the same manner as the first two coats. The skin should tighten just a bit, but not too much! This is a mistake often made by people who love those pulsating, very tight masques: They place a thick amount of clay on the face, and let it dry, which squeezes everything out of the pores. While one can do this, one needs to be aware that it can result in increased wrinkling of the skin. Using dry clay to squeeze the pores is really not necessary to get the most out of regular facial care with clay masques. One can end the session here, or add one final step. For deeper cleansing, gently apply a thin cover layer of clay over the three tacking coats. This time, don’t rub the clay in, instead just gently smooth it over the skin evenly. One can allow this final layer of clay to remain on the skin for five to ten minutes or so. However, rather than let it dry, have a spritzer bottle handy filled with something like rose water, or rose water mixed with some EIS (colloidal silver). The clay will act as a carrier, and the result will be a deep penetration of the very hydrating rose water. There is never a need to allow the clay to dry. It works best when kept moist. When ready, remove the clay from the face using a wash cloth wet with warm to hot water. Pay careful attention, and be certain to remove all of the clay, rinsing the face when done, or better yet, shower. Having removed the clay from the face, look carefully in the mirror at the pores. You may notice that the pulling action of the clay is still at work. With the warm/hot water opening the pores, one will often see that the pores are still cleansing, and visibly so. By paying attention to one’s experience with clay, as time goes on, one will notice a lessening of this visible effect. The skin becomes cleaner and cleaner at a deep level, and as it does so, it becomes healthier and more vibrant, with less of need to eject stored waste products. I’ve taught many professionals some of these methods to use with massage and personal cosmetic care. In fact, I once had a chance meeting with one of Stephen Spielberg’s massage therapists. I showed her some of my methods, and she was astounded at the difference they made, and wondered why they weren’t taught at any of the trade schools she’d attended. When clay is used on skin covering an unhealthy body, it cannot be used as often, although it can still assist in many ways. The problem is, as the clay pulls stuff out of the skin, the skin can react to the toxins in the oils. If the skin is overly dry due to electrolyte imbalance (it’s never ‘genetic’ like some people believe), the skin can become very irritated, and one must pause several days to allow the skin to recover. However, using a high quality natural mineral water can help to temper clay’s potential for drying out the skin. For an example, see our tutorial on how to make a highly structured and re-mineralized water, and how to use this water to hydrate clay: How to Hydrate Healing Clay Gel for External Use. There was a time in my early twenties where I could only tolerate clay twice weekly. Now, if desired, I can tolerate clay used on the face/skin twice daily. Though there is seldom a good reason to do skin cleansing twice daily, it is a method I sometimes use to see if I’ve kept my electrolytes in balance, my body properly hydrated, and a few other factors that will be discussed in future posts! If the skin is overly irritated and unhealthy, and one is still working on the underlying factors (liver toxicity is one of the biggest conditions), one can still use clay as a quick facial wash without causing a severe reaction. In such a case, an individual would likely also greatly benefit from clay baths loaded with sea minerals; the clay baths will help the entire body cleanse, and start to help take the load off of the primary elimination channels. Start with your favorite pre-hydrated clay magma/gel. Remove enough to do a facial, placing the clay in a small holding container. Mix in some organic first cold press olive oil. Do the facial as desired. After rinsing the skin, one should feel the hydrating/protecting effect of the olive oil. Start with your favorite pre-hydrated clay magma/gel. Remove enough to do a facial, placing the clay in a small holding container. Mix in a bit of apple cider vinegar. Depending upon the clay used, the ACV will react with the clay. Keep mixing until the bubbling subsides, and then do the facial as desired. You can of course use the olive oil or ACV at the time you hydrate the clay, but it is easier and safer (especially with the olive oil) if you do it at the time of use! Please note that this clay facial product has a shelf life; make small batches and/or refrigerate prior to use. There are many ways to use natural clay in fermentation processes. I sometimes like to make a very rich, organic, living probiotic clay which takes me more than six months. This, however, is a much more advanced procedure that needs to be done with care. The method I’m showing here is easy, safe and effective. Rather than hydrating clay with regular water, the first step is to mix the living organisms into the water. You can use structured water, re-mineralized water, purified water, etc. Add about ten drops of Dr. Teru Higa’s EM1 (Effective Microorganisms) per cup of water. This is a much higher concentration than normally recommended. One can use less, but I prefer more. EMs can be purchased here. This is a blend of non-colonizing organisms that exist to support one rare and amazing purple, phototrophic bacteria. This amazing bacteria is classified as an SBO (Soil Based Organism). One can also use SCD, but I prefer the energy of the EMs. You can also add a capsule of your favorite high quality probiotics. Having mixed in your organisms of choice, the next step is to hydrate clay as usual, with only one difference: Add a very small amount of high quality first cold press olive oil. Not much is required. 1/8 – 1/4 teaspoonful per cup of water is just fine. Mix the clay, olive oil, and clay very well. Allow this formulation to set for between 12 and 24 hours. For best results, use within three to five days. Refrigerated, one should be able to extend the shelf life for 10 to 14 days… HOWEVER, if this formulation is not going to be used within the first few days, one must be VERY careful with cleanliness. Make sure the storage container and lid are sterilized. Make sure one’s hands are clean. Make sure that any utensils used are also sterilized: Oil can sit on top of a clay particle, whereby it can be a nice snack for any microorganism that happens upon it! Due to the pulling action of clay, it is not easy (although there are some formulas I will share in the future) to do deep facial cleansing with clay without experiencing some dryness. The first step is not allowing the clay to dry on-skin. For individuals with vibrantly healthy skin, one will not notice that clay temporarily pulls oils out. For those with healthy skin, proper re hydration occurs within about 45 minutes after clay use. For the rest, it is important to properly care for the skin in order to protect it while it recovers and heals. Most “re-hydrating” cosmetics are chemicalized and work simply by the principle of insulation. It is this “principle” of “insulating” the body that people really need to get away from. While it is true that insulating the skin gives the appearance of glowing, hydrated skin, it can actually suffocate it, and it can interfere with the body’s natural and healthy breathing function. The skin needs to breathe and detox. Furthermore, many people are not aware that the skin can easily adsorb up to 60% of substances used on-skin. These substances go into the body, and either aid as health-promoting substances, or provide an additional burden that the body needs to work to cleanse. The desire for beautiful and vibrant skin should never have to have a negative health consequence. Luckily, there are truly natural and healthy topical products that can be used to nourish and protect the skin. Choose your products wisely! There are natural and exceptional moisturizers out there, such as a holy basil and neem ayurvedic cream that allows the skin to breath while nourishing and healing it. Or, one can make or purchase an overnight facial mousse and a frankincense serum. A perfect example of what to use after a deep cleansing facial is this organic frankincense serum. Of course, you can learn to make your own as well. There are many more topics pertinent to skin and tissue health, including proper fatty acid balancing and antioxidant use, as well as some other fantastic supplements that can dramatically affect skin and tissue health. They will be covered in future posts! Until then, may your skin breath deeply! How to use hydrated clay gel for fabulous facials. This is an incredibly rich website. I cannot get enough.